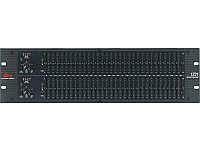 DBX 2231 Dual 31-Band Graphic Equalizer, It's amazing. One little button. It has so much effect. The Type III® Noise Reduction is an entirely new concept... virtually instantaneous encode/decode within the circuitry of the box. We started out to build the finest EQ's possible, boxes with the heritage and performance to rival our famous 30 Series EQ's. And to no one's surprise they came out awfully darn good. (Ask to see the Audio Precision plots compared to the competition.) But then, Roger (our chief engineer, a nice guy, as far as engineers go) got the crazy idea of putting this new noise reduction stuff in the box. We listened to it and were amazed. The EQ's sounded great without it but with it the performance was nothing short of incredible. Check it out yourself and see. But hey, Roger wasn't about to stop there. PeakPlus Limiter. Who knows more about limiting than the folks at dbx; nobody... that's who. So when the guys were developing this new series of EQ's they wanted something that would be unique to these EQ's. That's when Roger got another one of his bright ideas and said "I bet they'll work a lot better if there's a cool limiter built in." Next thing you know, all the guys are in the studio amazed at the new limiter Roger had designed specially for the 20 Series. Once again, hearing is believing... With a threshold range of 0 to +20dbu, the PeakPlus limiter is designed to tame your program material from the subtlest nuances to the rowdiest hits. Also, the four stage LED ladder gives you a great visual indication as to what the limiter is doing. 20 Series EQ's. You used to have to settle for second best in a reasonably priced EQ but not any more. 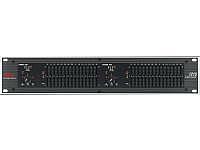 With the new 20 Series from dbx Professional Products you get a great EQ circuit, a graceful yet powerful limiter and the revolutionary new design of the Type III® Noise Reduction. 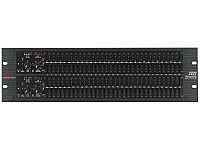 Check out the dbx 20 Series graphic EQ's at your pro audio outfitter. You'll see, with the 20 Series EQ's you get both MORE!! !